Hundreds of pretrial inmates from Texas are being housed at a private prison in Louisiana due to capacity issues – and state Sen. John Whitmire is decrying the practice. The Houston Democrat chairs the Texas Senate’s Criminal Justice Committee and addressed the issue during a hearing yesterday. “I discovered from being contacted by families last month that we have 700 Harris County pretrial confinees in Louisiana,” he said yesterday. The Houston Chronicle reports that Harris County Sheriff Ed Gonzalez ended the practice of outsourcing inmates shortly after taking office in 2017 – then Hurricane Harvey hit. The Harris County Criminal Justice Center flooded, leading to a backlog of cases and hundreds of extra inmates with no local jail space. But Sen. Whitmire said Harvey can’t be an excuse anymore. Whitmire says he plans to introduce legislation during the 2019 session that would prevent inmates from being outsourced to other states. He says there’s plenty of capacity within Texas to accommodate them. 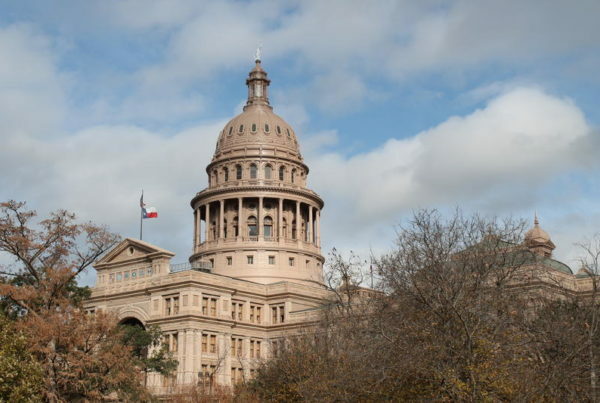 The Texas Education Agency is asking the state legislature for roughly $50 million to help schools identify and provide special educations services to students it failed to assist in the past. TEA commissioner Mike Morath spoke to the Legislative Budget Board Wednesday about the proposed funds for compensatory services. A federal investigation found Texas effectively capped the number of kids who could get services between 2004 and 2017, in violation of federal law. The State Board of Education voted unanimously Wednesday to continue requiring that students learn of Alamo defenders’ “heroism,” and the “Victory or Death” letter drafted by William B. Travis. The preliminary vote comes after the board faced conservative criticism for considering removing the language, in an effort to streamline lesson plans. Texas Public Radio’s Brian Kirkpatrick reports State Board of Education Chair Donna Bahorich was eager to put the controversy behind them. Board members say the controversy was overblown and was the result of streamlining work groups who were simply looking to rid redundant or self-evident teachings of the same subjects at different grade levels in public schools. The move is expected to be rubber-stamped in preliminary voting on Friday and again in November.